The time between today and the technological singularity is undeterminable. But the use of Artificial Intelligence (AI) or, at least, sophisticated predictive analytics and associated automated actions, is making an impact on tertiary education now. Recruitment, tuition, assessment and student advice are all being supported through AI and AI-type technologies, and at a rapidly increasing pace. Is this exciting or terrifying? Or both? This keynote address explores the potential future of AI in education by looking at actual current developments as well as some fanciful predictions. Whichever way things unfold, one clear conclusion is the need for ethical guidance for developers and users of AI and AI-type technologies. Now. Part realist and part sci-fi, this entertaining and thought provoking address will leave you viewing tertiary education in an entirely new light! Professor Carroll is a multi-award winning international leader on tertiary education quality assurance and technology-enhanced learning and, particularly, on the combination of these two phenomenon. Martin recently returned home to Auckland after 30 years pursuing these interests around New Zealand and the world. 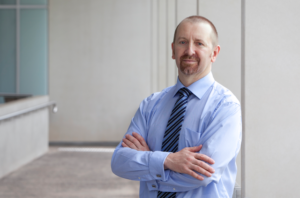 He is now the EGM Academic and Provost at Manukau Institute of Technology, a multi-campus tertiary institution providing programmes from Cert 1 to postgraduate qualifications across a broad range of disciplines and industry groups. Martin served for the last eight years as the Pro Vice-Chancellor Academic at Charles Darwin University, Australia, which is ranked in the top 2% of universities worldwide by Times Higher Education and as a “rising star” by Firetail. A multi-campus, multi-modal and dual-sector institution, CDU has been at the forefront of leveraging technologies to expand and enhance learning oppotunities. Martin combines technology-enhanced learning with robust attention to academic quality. He is the primary architect of the tertiary education quality assurance systems in the Sultanate of Oman and in the Dubai Free Zones, and is a Founding Member of the Dubai Government’s Universities Quality Assurance International Board. Martin serves as an expert reviewer in numerous countries including Saudi Arabia, Hong Kong and Australia, where he also led the establishment of the national Good Practice Database and the Australian Universities Quality Forum. In 2017, Martin co-founded with Blackboard a global forum for the Ethical Use of AI in HE.